Photo provided by Philipp Peterer. 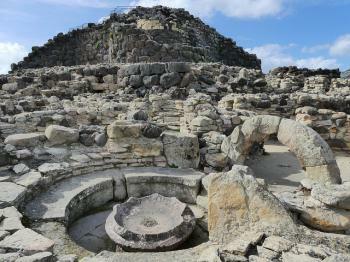 Su Nuraxi di Barumini is the most important 'nuraghe' megalithic monument of Sardinia. It is centered around a three-story tower built around 1500s BC. 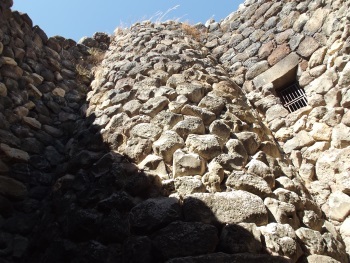 Nuraghe (Nuraxi) typically are truncated cone towers, in the shape of a beehive, built with huge square blocks of stone, and usually located in a panoramic position. The monument has no foundations, and stands only due to the of the weight of stones, which may weigh as much as several tons. Some Nuraghes are more than 20 metres in height. Today, there are more than 8,000 Nuraghes in Sardinia, though it has been estimated that once the number was more than 30,000. I visited this WHS in March 2017. Having visited most of the 'beehive' sites on the list and knowing that the cost of this visit would be quite steep at 11 euros per person, I had low expectations. Upon arriving at the Su Nuraxi parking lot, just outside the village of Barumini, I immediately spotted the highest nuragic structure and what seemed like circular structures which are quite similar to the ones of Choirokoitia in Cyprus. So to actually 'see' the site you can stroll by the street and view the nuragic site with the 15th century castle remains of Las Plassas in the background. 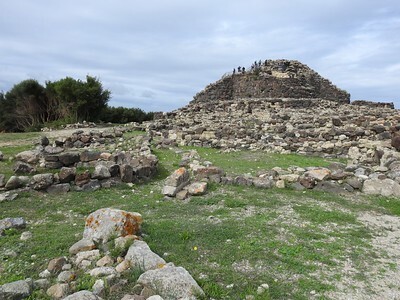 However, you'd be missing out on the very interesting guided walk through the nuragic complex and most importantly inside the nuragic 'fortress' which offers an unbeatable panoramic view of the whole site from the highest tower. Moreover, included in the entrance fee to this site are visits to Palazzo Zapata, which houses a limestone (whitish) nuraghe and several important remains found in Su Nuraxi and Centro Giovanni Lilliu which has an interesting collection of excavation photos and 3D models. The most important remain in Palazzo Zapata is the limestone model of a nuragic tower which was found in 'hut' 80 as it gives an idea of how the upper part of the towers must have looked like. It also helps to appreciate the signifance of the numbered basalt stones scattered around the site's perimeter which most probably belong to the uper parts of the towers. The site bears no aesthetic beauty even though the surrounding green countryside in March is quite pleasant. However, compared to other similar sites on the list, this WHS is by far the most complete and the most important out of the over 7000 nuragic sites in Sardinia. PS: bring sturdy shoes and comfortable clothes as you'll be climbing and crawling through some seriously narrow stairways and passages during your 1 hour guided visit. Visiting in the shoulder months also meant that we had a guide for ourselves and we were allowed to revisit and take photos alone after the guided visit. The UNESCO WHS inscription plaque is situated to your right once you enter through the wooden gate. The Su Naraghi near Barumini have the distiction of forming one of the largest and most complete of these strange villages. The dwellings are conical in shape and constructed of dry stone boulders carefully wedged together. The WHS is stuated 20 minutes walk from the village of Barumini. Although there are infrequent direct buses to and from Cagliari, I travelled to Barumini by train from Cagliari Republicca station to Isili on the Ferrovia de Sardegna railway. Then I caught a bus from Isili to Barumini. The site is very impressive and large. I was surprised one could go in, but this was only possible with a guide. There was no English speaking guide available, which made it hard to understand what we saw. With a little English book it was possible to understand some of it. 62 Community Members have visited.